For almost five years, Zenkraft and Rootstock have been working together to provide users with visibility into their inventory, order data, and shipments. With Dreamforce under a week away, we are excited to share that Rootstock and Zenkraft are extending their longstanding shipping relationship through deeper integration. Rootstock is updating its integration with Zenkraft to support Zenkraft’s multi-carrier shipping product. Rootstock’s customers can now leverage a single 100 percent native, shipping app to track shipments from FedEx, UPS, USPS, and DHL, in addition to numerous other international carriers. With this ability, the customer can add logistics connectivity embedded within Rootstock, saving up to 10 minutes of admin per order. The app, deeply embedded into the Rootstock workflow, includes Rootstock’s pick-and-pack process. Transmitting shipment data directly to the carrier means fewer errors, better logistics visibility, and less manual data entry. Once a shipment is in transit, the shipment status automatically sends updates every hour to provide the Rootstock user a 360-degree view of their customer’s shipment. 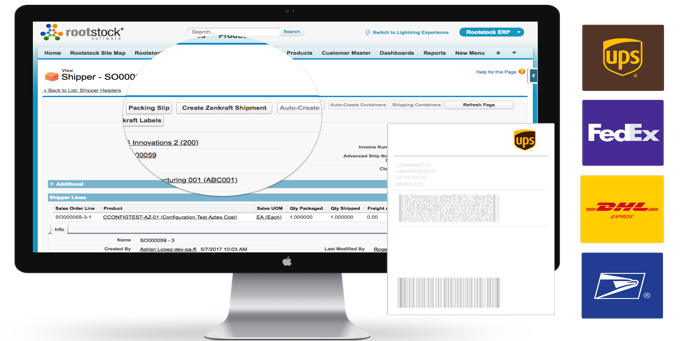 After a shipment has been delivered, the Rootstock Sales Order’s status is automatically updated to “delivered,” and since this all runs natively on the Salesforce Platform, sales or marketing activities can easily be triggered to gather data. One example of how this information can be leveraged is a customer satisfaction survey. If the user knows that everything ran smoothly throughout the shipment process, they know the time is right to ask for feedback. The survey data can then be leveraged to provide insight and help the user grow their business. The integration will be even more critical during peak shipping cycles. According to industry research, 70-80 percent of customer service inquiries during the holiday season deal with WISMO (where is my order). With this new Zenkraft and Rootstock integration and live shipping data, users know that even during peak times, they can focus on customer service, not shipping. Customer service is a critical component in keeping (or losing) a customer. With Zenkraft’s and Rootstock’s continued integration, users will have the ability to monitor their customers’ shipments and step in immediately if needed. Both companies are excited about this deeper integration and are looking forward to continuing to work together in the future. For more information on our partnership, come visit us at Dreamforce 2018: Zenkraft will be in booth #1812 and Rootstock in booth #912.